I recently spent a few days at the Home Depot headquarters in Atlanta, Georgia. 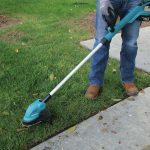 I toured the facility, explored the company’s Product Quality and Engineering Laboratory, and got a peek at the latest in tools and equipment from the premiere brands that will stock store shelves this year. I also participated with a team of furniture builders to assemble 55 new chest of drawers for charity. 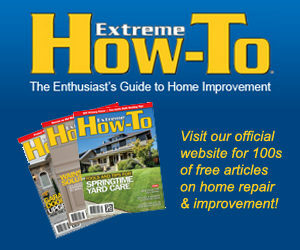 Because the editorial aspect of Extreme How-To is essentially a one-man show, I was backed up with magazine work when I got returned from Georgia and I’m a little late blogging about my trip. I’ve finally caught up on the workload, though, so I wanted to share what I saw. 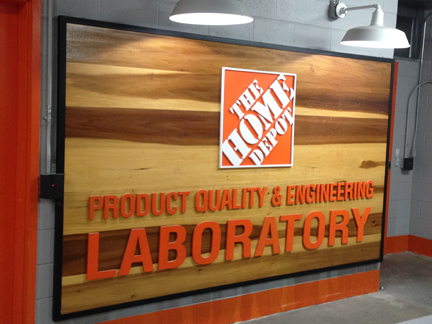 I was particularly impressed to see The Home Depot Product Quality and Engineering Lab, where the company’s engineers test private brand products to make sure they not only meet but exceed the customer’s most demanding application expectations as well as the advertised claims. 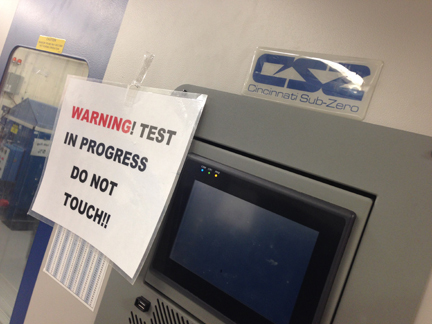 A standard product test must deliver results that exceed the advertised product claim rating. For example, a strength test that applies load on a Husky tool cabinet will have a heavy steel plate driven down onto it from the testing machine, and if the frame or wheels fail before it reaches the claimed load plus a target safety factor above and beyond the published load capacity, then a cabinet has failed the test. Every Husky product receives the same scrutiny. 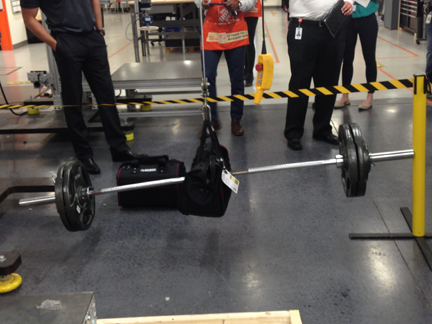 Another interesting test showed a Husky tool bag supporting a weighted barbell to determine the durability of the bag’s carrying handle. 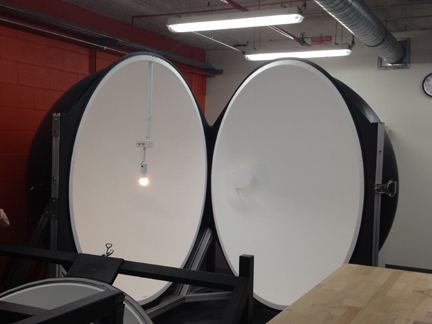 The testing lab subjects the tools and equipment to all sorts of stress factors, including harsh environments such as salt air and extreme temperatures. Even the product packaging is put through the wringer of drop tests, crush tests, and all manner of roughing up to make sure a piece of equipment ships to the end-user in sound shape. I left the Home Depot headquarters with the impression that the tools—and packaging—that are sold at the company’s outlets are built to last. Testing the handle strength of a Husky tool bag. Testing the light output of household light bulbs. Tool materials are subjected to harsh environments. 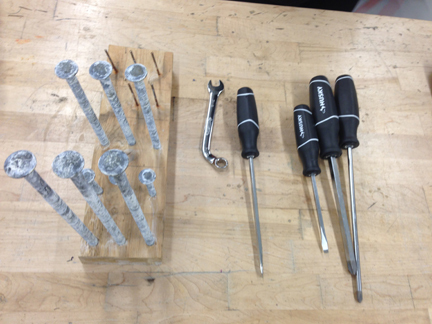 Shown are the comparative results of a salt air test between bare steel and Husky’s coated tools. 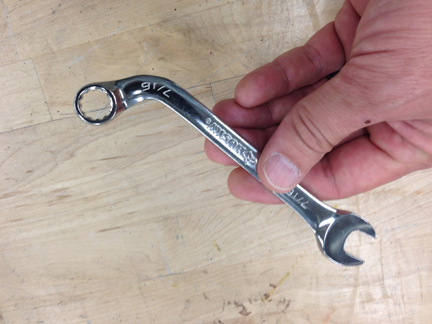 Husky wrenches are designed to bend, not break. 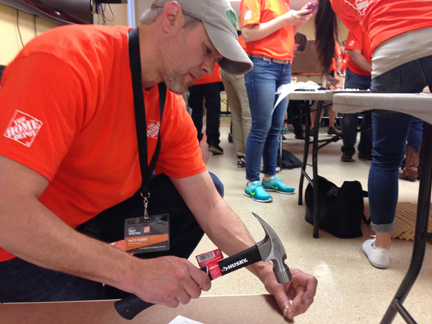 Check our blog next week, where I’ll report on our charity furniture build, orchestrated by the Home Depot, as well as some of the new cool tools I previewed.